Policing is in a state of crisis right now. The protests in Delhi and elsewhere bear testimony to the public angst against the police. Our anger has notched up a big victory by getting the slumbering government to issue an irritated question, “What can we do to get you to shut up and go home?” What are we going to tell them? The police are viewed with the same terror today as they were by our ancestors during the British Raj. The attitude of policing then was that of rulership. When someone is picked up by the police today, the family does not know if that person will ever return home. To make matters worse, an unhealthy collusion with the political classes has led to a situation where we find it hard to trust the word of the police. Blaming and cornering the police is tempting but unhelpful, for it is just another way of dehumanising them, which is no better than what we often accuse the police of doing to us. For any positive change in the situation, a sea change is needed in our perspectives on policing and what may be possible. For my PhD dissertation, I studied the history of the Stanford police department that had its modern origins in the violence of the 1960s and 1970s during the civil rights and the Vietnam era. Due to riots on campus and a massive breakdown in law and order, the university recognised the need for a professional police department on campus that went beyond the existing department’s function as security guards. Instead of calling in public police who would come in with riot gear, beat up and arrest students, they wanted a more sensitive approach that involved a deeper understanding of students. But professionalising an existing police department was easier said than done. The university hired Chief Marvin Herrington, who was very passionate about policing values. He realised that the department he’d taken charge of was not well trained. He took away the officer’s guns and had them reapply under much higher standards — standards that are a no-brainer today. He brought in ideas that were shocking — that the police had to look at everyone as their client, including those they arrested! His officers resisted such a shift, but Herrington persisted, insisting in the dignity of even the drunk they’d pick up. Those who didn’t accept his ideas retired and eventually he only had people who accepted these values. The foundation of values that Herrington built continues to this day. I experienced their culture by riding along with the police officers as part of my research. When arresting severely drunk students, officers would tell me that the students could really hurt themselves in that state, so they would arrest them for their own safety, transport them to the hospital and send them home when they had recovered. 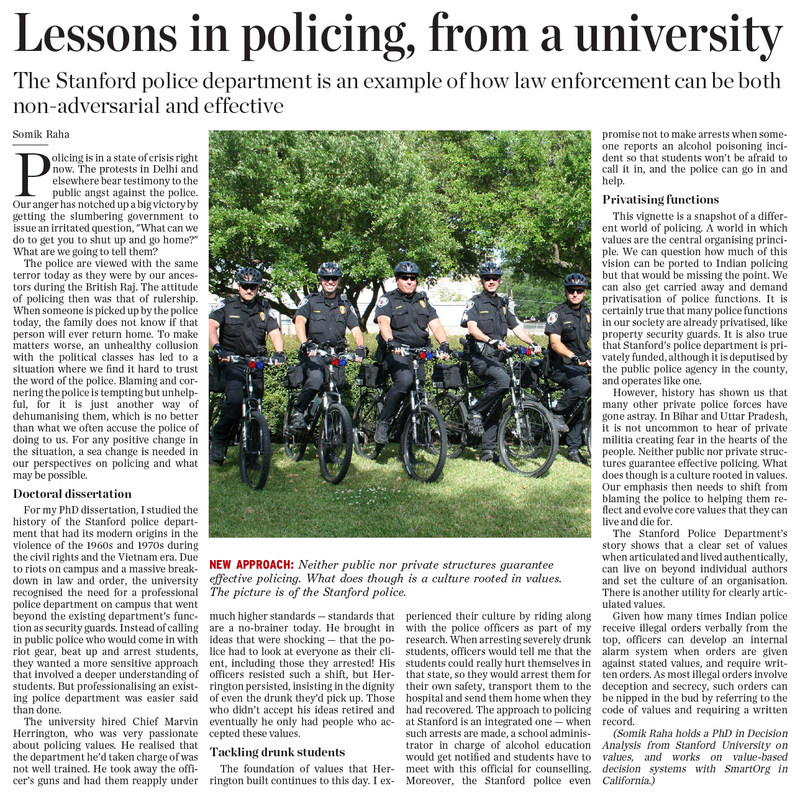 The approach to policing at Stanford is an integrated one — when such arrests are made, a school administrator in charge of alcohol education would get notified and students have to meet with this official for counselling. Moreover, the Stanford police even promise not to make arrests when someone reports an alcohol poisoning incident so that students won’t be afraid to call it in, and the police can go in and help. This vignette is a snapshot of a different world of policing. A world in which values are the central organising principle. We can question how much of this vision can be ported to Indian policing but that would be missing the point. We can also get carried away and demand privatisation of police functions. It is certainly true that many police functions in our society are already privatised, like property security guards. It is also true that Stanford’s police department is privately funded, although it is deputised by the public police agency in the county, and operates like one. However, history has shown us that many other private police forces have gone astray. In Bihar and Uttar Pradesh, it is not uncommon to hear of private militia creating fear in the hearts of the people. Neither public nor private structures guarantee effective policing. What does though is a culture rooted in values. Our emphasis then needs to shift from blaming the police to helping them reflect and evolve core values that they can live and die for. The Stanford Police Department’s story shows that a clear set of values when articulated and lived authentically, can live on beyond individual authors and set the culture of an organisation. There is another utility for clearly articulated values. Given how many times Indian police receive illegal orders verbally from the top, officers can develop an internal alarm system when orders are given against stated values, and require written orders. As most illegal orders involve deception and secrecy, such orders can be nipped in the bud by referring to the code of values and requiring a written record. This was carried in The Hindu, Dec 28, 2012.